Sneak: You start with Stealth Mission and Elixir of Light Feet in play. Parley: The Field Lane becomes an Eclipse Lane with "After a creature is summoned here, trigger its Last Gasp." Eclipse Hideout is a location in Bravil. You will have a choice between Sneak, which means that you will lose if any of your creatures are destroyed, and Parley, which features an Eclipse lane: "When a creature is summoned here, trigger its Last Gasp ability". In master difficulty, the opponent will begin with Skooma Frenzy in play if you choose to Parley. Kellen: "The Agent faced a choice: Should they sneak in and assassinate the leader, or walk in and attempt to parley?" If the player chooses "Sneak"
Game Hint: "Move carefully. If any of your creatures are found and destroyed, you'll lose." Kellen: "The agent had killed the Eclipse's leader, fulfilling half of Andronica's contract. Now to meet with the Claws." If the player chooses "Parley"
The Eclipse: "You want to talk to the boss? You'll need to go through us!" Eclipse Baroness: "What is going on out here? Let us talk like civilized people." Eclipse Baroness: "The Claws have your compatriot? Then we have a common enemy. I will send some of my men to help you assassinate the rogue." 2 Daggers in the Dark Action 0 – – 1 Common Equip a Steel Dagger to a random friendly creature in each lane. 2 Lesser Ward Action 0 – – 1 Common Give a creature a Ward. 2 Brutal Ashlander Creature (Dark Elf) 1 1 1 1 Common Last Gasp: Deal 3 damage to a random enemy. 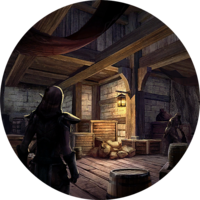 2 Balmora Spymaster Creature (Dark Elf) 2 0 1 3 Epic Last Gasp: Summon a random creature with cost less than or equal to your max magicka. 3 Ice Spike Action 2 – – 1 Common Deal 2 damage to your opponent. 3 Palace Conspirator Creature (Dark Elf) 2 2 2 1 Common Summon: Draw a card, then discard a card. 1 Brilliant Experiment Action 3 – – 3 Epic Draw a copy of a friendly creature. 2 Elusive Schemer Creature (Dark Elf) 4 3 1 2 Rare Summon: Draw a card. 3 Eclipse Baroness Creature (Dark Elf) 8 5 5 3 Epic Summon and Last Gasp: Draw a card and reduce its cost by 2. 3 Brutal Ashlander Creature (Dark Elf) 1 1 1 1 Common Last Gasp: Deal 3 damage to a random enemy. 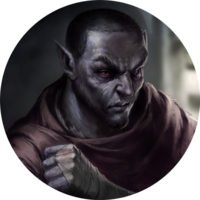 3 Balmora Spymaster Creature (Dark Elf) 2 0 1 3 Epic Last Gasp: Summon a random creature with cost less than or equal to your max magicka. 2 Dunmer Nightblade Creature (Dark Elf) 2 2 1 1 Common Last Gasp: Put an Iron Sword into your hand. 3 Deshaan Avenger Creature (Dark Elf) 4 3 3 2 Rare Last Gasp: Summon a 3/3 Deshaan Sneak. 3 Elusive Schemer Creature (Dark Elf) 4 3 1 2 Rare Summon: Draw a card. Winning the match by sneaking is one of the two requirements for the title "The Master of Stealth". This page was last modified on 13 August 2018, at 19:44.